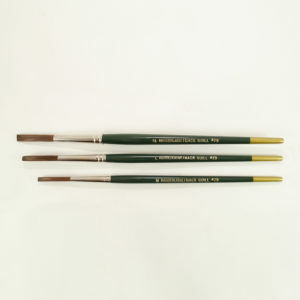 Mack/Tidwell brushes? 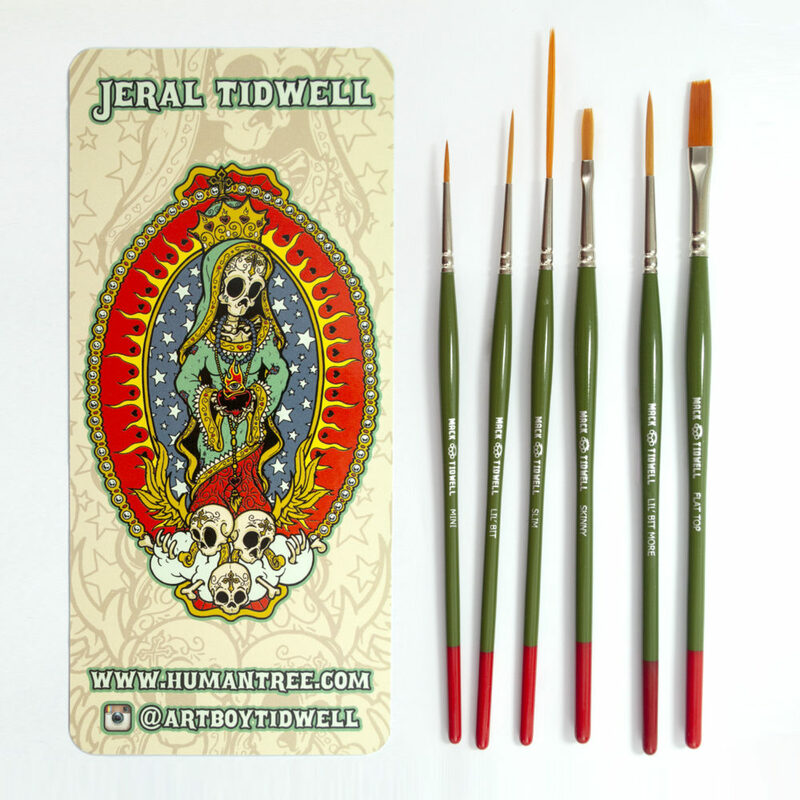 Well, I didn’t set out to reinvent the wheel, however, I wanted to make a brush set for other artists like myself, illustrators who work in a few mediums. 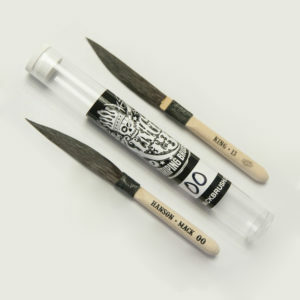 When you’re working on finks, eyeballs, monsters, etc…these brushes will prove themselves invaluable. The purpose of the set is to make all of your detail work faster and easier, plain and simple. 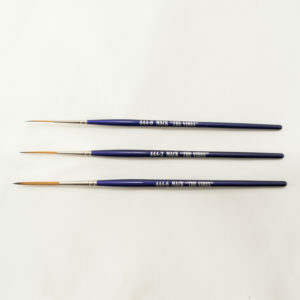 These brushes work great with enamels, acrylics, oils, and I’m sure they will work with just about any other medium. You have the Mini, Lil’Bit, Slim, Skinny, Lil’Bit More, and Flat Top. The handles are a little fatter in the belly (where you grab ’em), so they have a little more room for normal-sized hands (see the picture for a good idea). It’s not much, but I like to think it’s just enough. 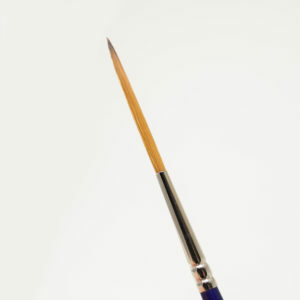 The bristles vary depending on the brush size and configuration. 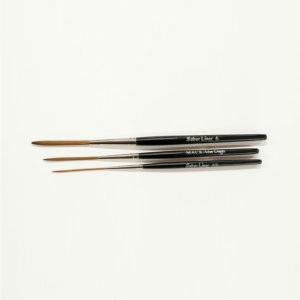 The smaller brushes are made of a softer, fine quality synthetic. 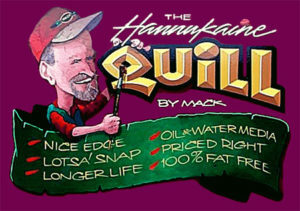 The large flat and the long outliner are made with golden synthetic. 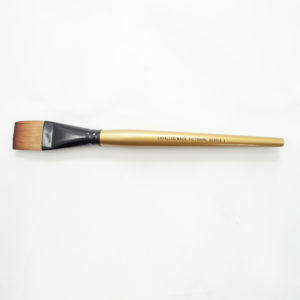 I chose synthetic because these brushes are much easier to care for and keep their shape extremely well. 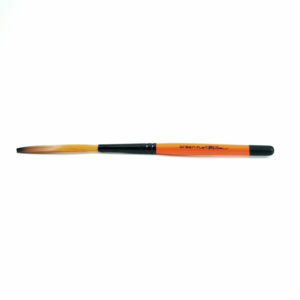 Both types of bristles have smooth paint delivery while keeping a little spring to them. 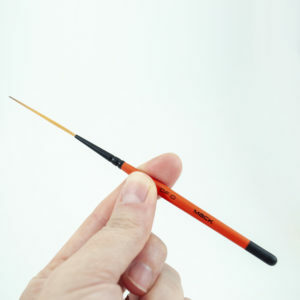 All of the brushes are super useful and you will find yourself reaching for them in a hundred different situations. They blend paint really well without the brush strokes of stiffer bristles. 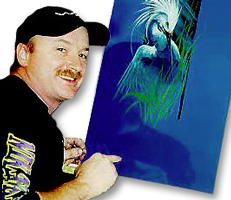 They also work for lines, shading, and for sharp detail. The brushes really speak for themselves. 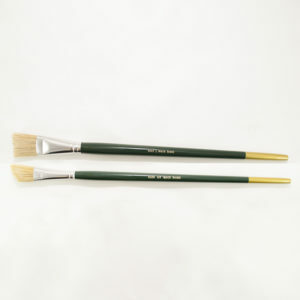 There are a couple of other brushes that the set needs, so we are working on those now. 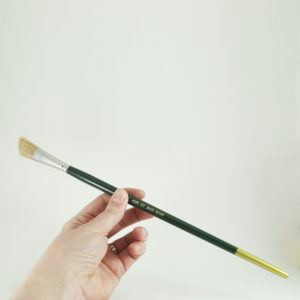 I know there is no perfect brush or brush set for everyone, but I seriously doubt you’ll find a more useful brush set at this price point or any for that matter. 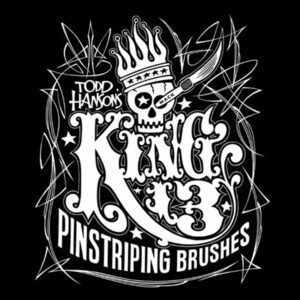 Not to mention, they are the only brushes on Earth with brass knuckles stamped on the handles!